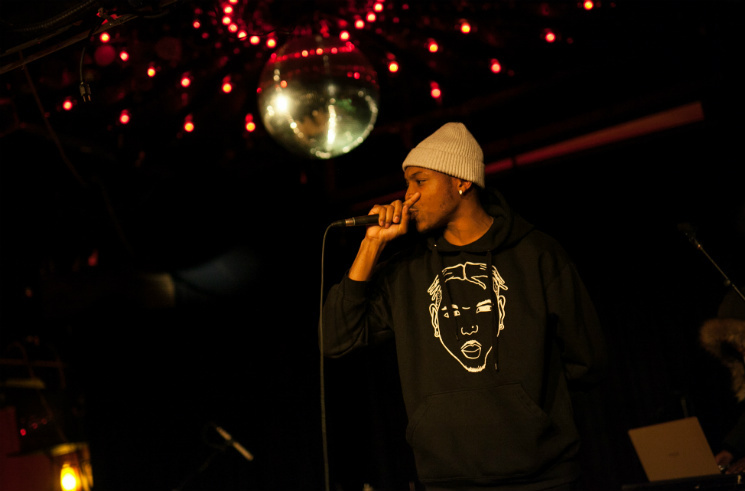 Hailing from Toronto's West End, rising rapper Clairmont The Second made the most of a sparse crowd, using the intimate atmosphere to highlight his storytelling prowess. The rapper's lyrical dexterity and engaging narratives drove the set's best moments. Early highlight "Fo Myself" stood out even before the synth and distortion kicked things up a notch, with Clairmont's production and flow working together to convey his declaration of independence. The anxious and urgent "44 Me" from 2016's Quest For Milk and Honey was given a more visceral makeover than its studio version, adding extra punch to the MC's tales of violence. It wasn't just his serious side that delivered the goods — there was plenty of levity too. "Gheeze," from this year's album Lil Mont from the Ave, was plenty lighthearted thanks to Clairmont's relaxed, confident delivery. Despite engaging the crowd with his boundless energy, even Mont himself knew there was potential for more. "I move around way too much for this cord," he said about the mic cable tethering him to the stage — with a bigger setup and less wiring, Clairmont's poised to soar.